California State University, Northridge’s student leadership is extending beyond its campus, with Gov. Jerry Brown appointing former Associated Students (AS) President Jorge Reyes Salinas a student trustee for the California State University (CSU) Board of Trustees, and AS Attorney General Christian Rubalcava to the California Student Aid Commission (CSAC). Former CSUN AS President and new CSU Student Trustee Jorge Reyes Salinas. Photo provided by Jorge Reyes Salinas. As the new student trustee, Reyes Salinas will work alongside board members from all 23 CSU campuses for the next two years; his second year will give him voting power. Reyes Salinas also has been elected as the new California State Student Association’s vice president. He will be helping to create transparency and open communication among the CSU’s AS organizations. 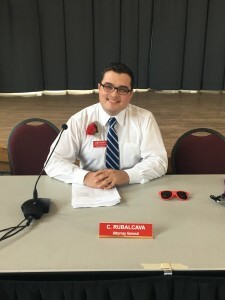 Twenty-year-old Sylmar resident and business management major Rubalcava will start his new position on the CSAC with three years of public service as a member of his community’s Neighborhood Council in addition to being appointed AS’ new Attorney General. Rubalcava said he feels that his position on the CSAC will help him reach out and make more students aware of state financial aid benefits. Twenty-three-year-old Chatsworth resident Reyes Salinas migrated to the United States from Lima, Peru, when he was 10 years old. He is a second-year graduate student in communication studies studies, recently completing his undergraduate degree in broadcast journalism at CSUN. He served as the 2015-2016 AS president. During his tenure, he advocated for more on-campus resources, such as a food pantry for students, more transportation routes to the campus from the LA Metropolitan Transportation Authority, and a safe space for undocumented students coming to the university. CSUN AS Attorney General Christian Rubalcava is the California Student Aid Commission’s new board member. Photo provided by Christian Rubalcava. make education resources more accessible to CSU students across the state. Reyes Salinas noted that he was inspired to apply for the student trustee position by former 2014 AS Vice President Talar Alexanian, who was the first CSUN student to hold the CSU student trustee position. Reyes Salinas joins CSUN computer science professor Steven Stepanek and Debra Farar, an alumna with her master of arts degree in education, on the CSU Board of Trustees. 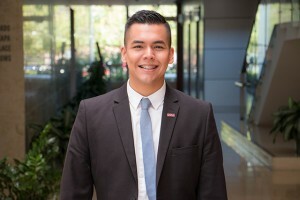 Reyes Salinas noted that his goal is to be more hands on and to utilize the lessons he learned as CSUN’s AS president to promote open communication in the CSU system. Rubalcava said he was also inspired to run for state positions by his AS president, Reyes Salinas.